This powerful documentary about Nancy and her family’s journey through many years of struggling with painful and debilitating symptoms with an unknown cause, eventually being diagnosed with an extremely rare autoimmune disease, Relapsing Polychondritis (“RP”), and ultimately finding the strength and courage to persevere with a purpose to raise awareness about RP, help others in diagnosis and support, and advance research efforts about this and other autoimmune diseases in pursuit of treatments and cures. Nancy once lived a very active lifestyle – running marathons, biking, climbing, hiking, and even trekking throughout the world. But eventually she had to abandon this active lifestyle and even normal routines as she struggled to get through the day without pain. Nancy’s journey began with a rash and soon the testing and biopsies began. The endless list of possible diagnoses was thoroughly explored, and one-by-one ruled out. The list of what it wasn’t grew with each visit to another doctor or specialist, though the answers of what it was continued to elude her. In this documentary we hear firsthand from Nancy’s family and loved ones about the challenges they experienced knowing Nancy’s health was deteriorating without any concrete answers as to why. The top health organizations and medical professionals were unable to determine the cause of Nancy’s symptoms. Though the severity of her symptoms varied from day to day, the pain continued and her outlook on life diminished while hope was starting to fade. But there was ultimately an answer, finally a diagnosis. In this film we listen to Dr. Walter J. Urba M.D. Ph.D, as he thoughtfully explains the complexities of reaching this diagnosis and the medical protocol that often steers physicians in the wrong direction. What was Nancy’s Diagnosis? Relapsing Polychondritis, a rare autoimmune disease affecting the cartilage throughout the body including in the joints, ears, nose, critical airways and organs. It was in fairly short order that Nancy and her family discovered how extraordinarily rare this disease was. It affects approximately 3 to 5 people out of 1 Million. And they soon realized how little information and resources were available about Relapsing Polychondritis. 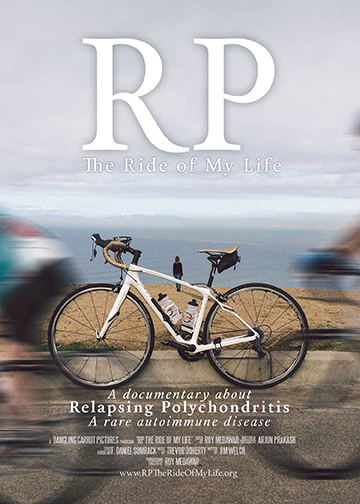 Though driven by a sense of urgency to learn everything they could about RP and to determine a course of action, the lack of information and understanding about the disease and treatment was discouraging. But this wasn’t going to stop Nancy. It soon became clear that Nancy herself was going to be a catalyst of change and advocate to raise awareness about Relapsing Polychondritis and the autoimmune diseases community. Nancy knew she had to tell her story and share her experience of the years of struggling leading up to her diagnosis and the aftermath of navigating the medical community. It was a decision that would change her life. She knew there was no cure for RP, but she wouldn’t feel sorry for herself. Instead she would become a champion of a small but growing community committed to facilitating research, finding the underlying cause, identifying the gene, developing specific tests and creating a drug to treat and possibly cure Relapsing Polychondritis. Thank you, Nancy. I was amazed at how positive and determined you are! I feel lucky to have crossed this video. I needed this. I just realized I have this along with several other conditions of mine. I will make it and be even stronger. Thank you again!! Thank you so much for making a video that I can refer friends and family to so that they might better understand what I am living with. This is truly an incredible gift to the world! As I am both an RP patient and a support group moderator, I have connected with many people around the world who have not yet, or have just been, diagnosed. This film gives a tool, along with hope and purpose, to be their own advocate and find the help they personally need! Thank you so much, for your invaluable contribution!